project you can do yourself! the nursery is for my clients 5th child. she has 3 boys, and (now) 2 girls. other children in the nursery. for this one, i simply used the font "bodini ornaments"
to get the floral shape. the "A" is "times new roman". and the baby's initial to be in pink + navy + white. and the girl silhouette another. and they cost between $1.50 and $3 a piece. silhouettes they would be holding. but here is my super quick and very stripped down version. a side view picture of her 4 children. 2. once i had the pictures, i printed them out. 3. i outlined their faces, and made a few adjustments, as you can see. ironed it onto the back side of the fabric. backside of the heat and bond. the heat and bond, and the fabric. 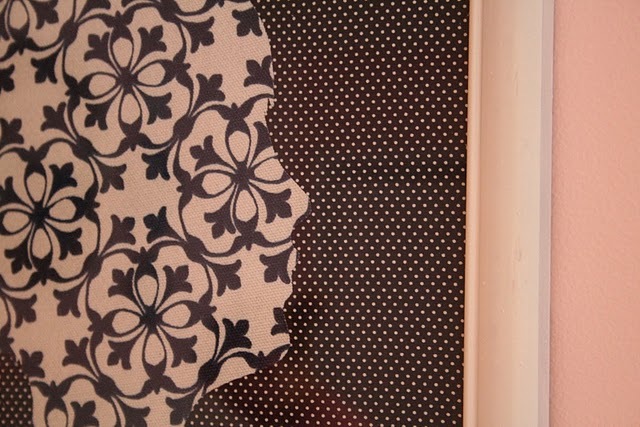 attached silhouette, and ironed it onto the background fabric. we ended up not using this particular silhouette. a floral, as you ca see below. making a fun and personal statement! These turned out SUPER CUTE! I love the idea with the fabric. 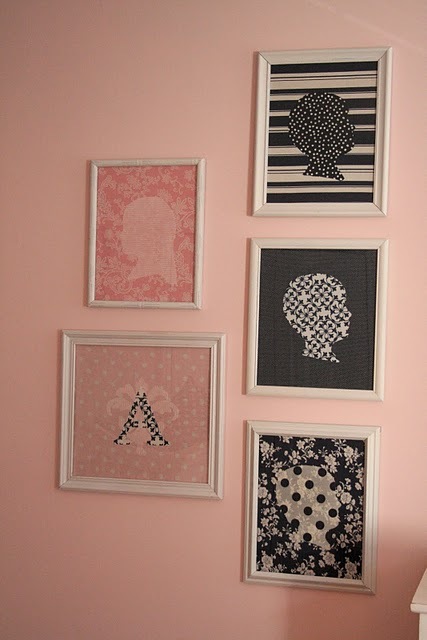 I have been stocking up on some old frames and now I need some cute fabric. Thanks for such a great idea. Can't wait to see the nursery done. This is so cute! What a great way to spice up old frames. I love this project! So fun and doable. I really love these! I never thought to use fabric, I like the contrast. Great job! Very pretty! I bet they love it! 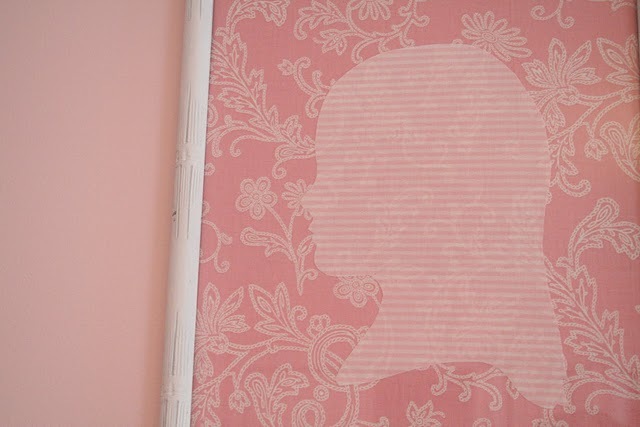 like you, i've seen tons of silhouettes, but i love the fabric on fabric. fantastic job! wow. i am in love. just found your blog and i think its adorable. keep showing your talents to us!!!! beautiful! thank you for the how-to! I'm dying because I had that pink frame with the heart wreath as a kid. It was from one of those parties where you buy candles and plastic flowers to decorate the candles. Some seriously ugly stuff. I really wanted that picture and my aunt bought it for my birthday! - jennie h.g. visit me @ www.mommiesandbeyond.com to see our project when complete.